Nowadays Pakistan Needs National’s to join Its Armed Forces Because of Defence Reasons. Almost Everyone Want to Join Pak Navy Army and Air Force to protect our country and In order to serve Pakistan. 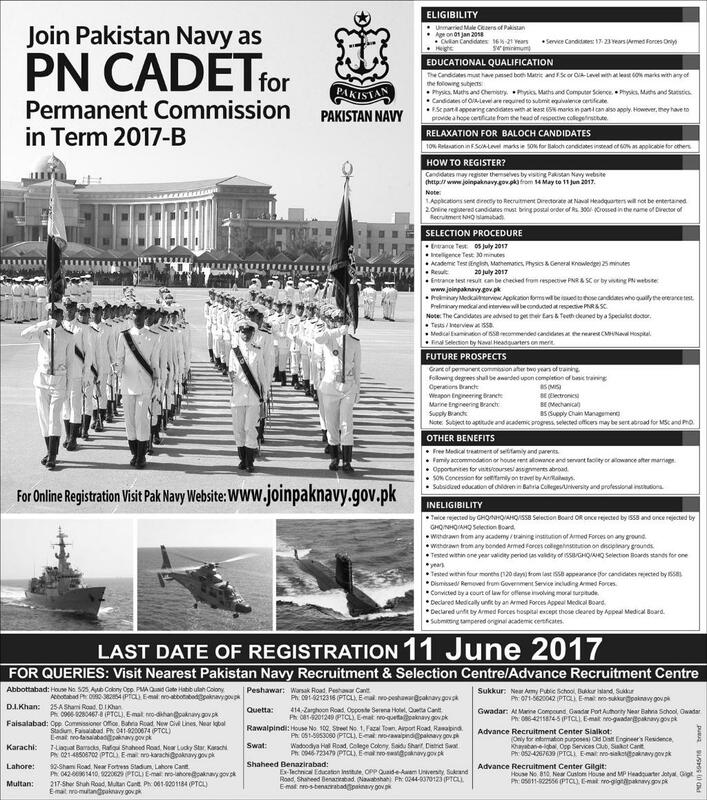 So if you want to join Forces of Pakistan then nowadays you have a good opportunity to join Pak Navy as a PN Cadet Permanent Commission 2017-B. Application Form Submission Last Date: 11th June 2017. Complete Instructions Age Height Gender Nationality Martial Status etc has been provided below. Requirements This is the main scheme for enrollment of officers in Pakistan Navy. Under this scheme candidates are inducted twice a year as PN Cadet. This type of commission is offered in the following branches after the successful completion of 2 years initial training. For the Further Details and Online Test Preparation of Join Pak Navy As A PN Cadet Permanent Commission Term 2017-B Online Apply Registration Form Eligibility Criteria keep stay with us here on this page.